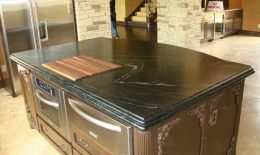 Marble - Granite Source Inc.
Marble is an undeniably beautiful material that instantly creates a sense of elegance and grandeur in a room. 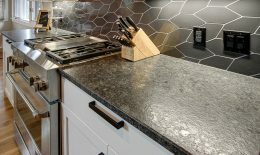 While it is wonderful to cook on, particularly if you’re baking, it is a soft, porous, high maintenance surface that is vulnerable to staining and etching. 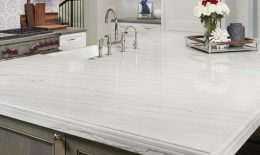 Marble is a perfect example of luxury and while luxury is never cheap, there are still some affordable options, such as Carrara. Marble is a metamorphic stone, which is formed when sediment crystallizes under great heat or pressure to form hard rock. 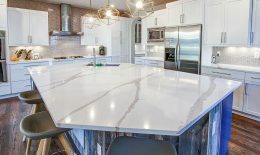 Marble is also formed out of calcium carbonate, giving it a chemical structure that reacts easily with acids and leads to etching on the surface. 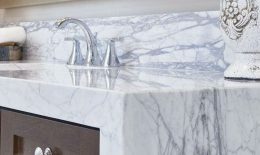 Marble is very porous and will require yearly maintenance. Spills need to be immediately wiped up to avoid staining. 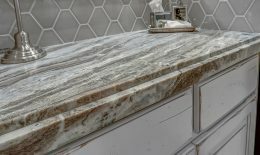 Although marble requires some maintenance to keep it pristine, many prefer the gradually aged surface with etches and stains that blend into the grey veins over time. 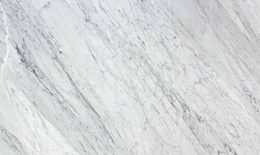 Double coated marble, resistant to stains, great for bathrooms. White base with veins of black and gray.